We are rather used to the sounds that surround us in everyday life. Whether it’s the TV, loud music, the traffic, or people talking loudly on their phone, we cannot escape the urban noises that we ourselves have created. They are all part of our culture and we have become quite acquainted with them. But what is noise pollution and how can we prevent losing our hearing because of it? The matter of fact is that modern noise doesn’t disturb us anymore. It becomes a problem, however, when the traffic gives you a headache, or when the TV leaves you with a ringing in your ears. At that point, it’s not just noise anymore; it’s noise pollution. Any sound that disrupts the natural rhythm of life is enough to be classified as pollutant. 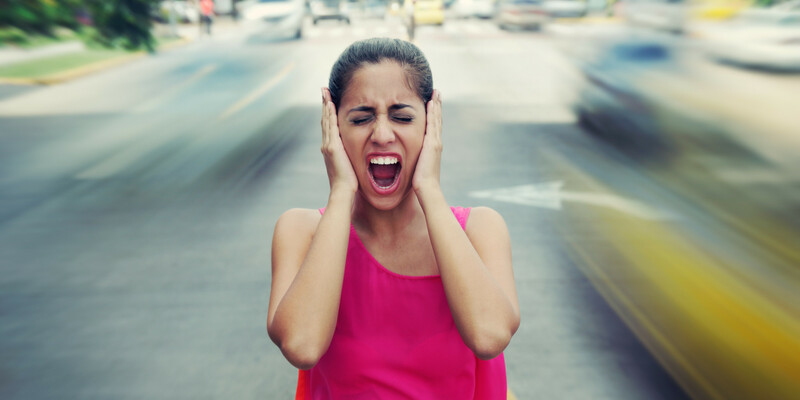 One simple definition of noise pollution is ‘unwanted sound released into the environment.’ Noise pollution disturbs us by causing adverse effects on our psychological and mental well-being. Measured in decibels, noise is denoted by the dB; anything higher than 115 dB is intolerant. Therefore, the World Health Organization has set the industrial limit of sound at 75 dB. To gain some perspective, a typewriter typically produces a sound of 60 dB. In the modern world, we deal with plenty of sources of noise pollution, including agriculture machines, bulldozing, crackers, heavy industries (stone crushing), entertaining equipment, the blasting of dynamite, defense equipment and textile mills. Most of the heavy industries use big machinery capable of producing high levels of noise. Additionally, we have developed large equipment (like compressors, exhaust fans, generators, and grinding mills) which also contributes to the production of big noise. Due to the astounding noise, workers in factories are required to wear noise-cancelling headphones. In many developing countries, poor urban planning also plays a vital part in noise pollution. Congested houses, constructing highways close to residential areas, fights over insufficient parking – all of these lead to noise pollution that disrupts the general environment of society. Noise is often at its peak at social events – whether it is a wedding venue, a pub, club or place of worship. Some of these places flout local noise rules and create nuisance in the area. People living nearby a club, for instance, will hear songs played on full volume way past midnight, which is a pretty bad condition to live in. We rarely walk anymore as we have become highly dependent on vehicles to take us where we need to go. The large number of cars on our roads, planes flying over our houses, and underground trains hurdling at high speeds – all of these contribute to heavy noise in urban contexts. There’s only so much noise our ears can tolerate, so the high noise can cause a person to lose the ability to hear properly. Almost every part of the world is still under development – some more than others. Under construction activities are quite unavoidable, including the construction of bridges, dams, buildings, stations, and roads. These loud activities take place every day, because we need taller buildings and stronger bridges to accommodate more people and to reduce traffic congestion. Turn your music down, especially when using headphones. Also, turn off electronics when you are not using them. Whether it’s a spinning fan or a high-pitched screech from the TV, do not keep devices on standby. Over time, all of these sounds cause stress on the ears. Wear earplugs or proper earmuffs when you participate in a loud activity. Sporting goods stores can provide you with special earplugs that bring down the noise in a sporting event without completely blocking it. If nighttime noises keep you awake, earplugs can help you catch a good night’s sleep. Mask or cancel noise with the help of wind chimes or small water features. It might seem counterintuitive because you are adding noise to your environment, but these things might help mask the unpleasant noises. Use a white noise machine – especially if noise pollution disturbs you at night. White noise can effectively mask most outside sounds. People using such machines report having restful nights of sweet slumber. If you think you are experiencing hearing loss, it is imperative you see a doctor. You should have an otolaryngologist consult you – a doctor who works on the ears, nose, throat, head, and neck. In addition, it would help undergoing a medical exam by an audiologist (someone who tests and helps people with hearing loss). If NIHL (Noise-Induced Hearing Loss) could be cured the way glasses correct poor eyesight, then we wouldn’t be so worried about deafness. However, NIHL is a cumulative disorder that develops over time, causing sufferers to lose the ability to hear both higher frequencies and softer sounds. Extended exposure to high levels of noise damages the hair cells in the inner ear. At first, the damage caused is temporary, particularly if the exposure is limited to an occasional rock concert. People walking out of rock concerts often experience the so-called “filled” ears, which makes it difficult to hear for a few hours. However, full hearing does eventually return. On the other hand, continuous exposure to excessive noise causes sustainable damage to the hair cells. When they break off and lose their ability to sense sound, you lose your hearing. Unfortunately, hearing aids cannot restore the broken or dead hair cells. Despite continual improvement in hearing aids, wearers cannot regain perfect (or near perfect) hearing. Furthermore, there is also danger in wearing hearing aids in higher noise environments. Instead of helping the wearer hear better, it accelerates NIHL as it adds to the daily dose of noise the person receives. Hearing aids are meant to amplify sounds, so they should only be used in quieter areas.